I’d like to take today to invite everyone to the second “Concert on the Holodeck,” an exploration into the possibilities of networking and distributed performance. The NYU Immersive Audio Group and Future Reality lab present the second HoloDeck concert. This unique event explores the future of distributed musical connections for mixed reality setting. 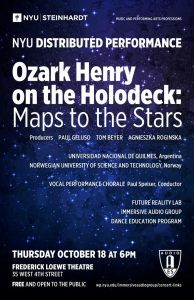 This HoloDeck Concert will involve a distributed concert featuring live performances by international gold and platinum Sony Music recording artist Ozark Henry. The concert will include latest immersive sound technologies and internationally distributed musicians, motion captured-driven avatars interacting with live dancers. This is an ongoing exploration into the creative application of the NYU Holodeck including Immersive sound technologies such as Ambisonics, live MPEG-H broadcast, multi-channel immersive sound and visual system. Remote locations include Trondheim, Norway, and Buenos Aires, Argentina. This concert is in collaboration with THX and Qualcomm and will demonstrate the usage of an off-the-shelf Ateme real-time encoder to stream MPEG-H audio and render THX Spatial audio over loudspeakers in a 5.1.4 configuration. 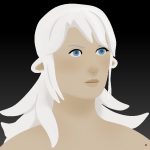 The FRL has been assisting with the motion-capture component, making sure that data from dancers in our lab building can get seamlessly transmitted to the concert theater across town, allowing them to perform real-time with the musicians and dancers there.